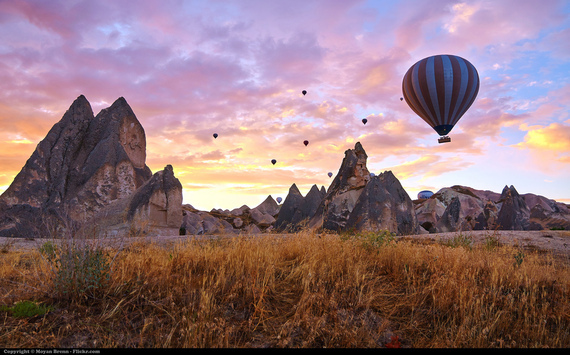 We landed in Istanbul in the morning and then took a domestic flight to Goreme, a town located in the famed Cappadocia region of Turkey. The town is spectacularly located among the "Fairy Chimney", rock formations. These are thin spires of rock that protrude from the ground and range from a height of about 1.5 to 4.5 meters. We checked in to one of the Cave suites, which were actually built into one of these rock formations, the interior of the hotel was, to say the least, nothing less than lavish, though it all came at a price. We had a quick, quiet dinner and decided to retire for the night as we needed to get up early the next morning for the surprise that I had planned for her. I looked at her as she lay on the bed, she looked so beautiful and the same time so vulnerable. Looking at her I wondered how she could be so strong. I had not told her what the surprise was and she had not pressed me, going along with me and humoring me. I was happy to see that she was happy. I could see that from the twinkle in her eyes, I had not seen that twinkle for a long time. Her gentle snoring rose to a crescendo and jolted me out of my thoughts. I looked at my watch, it was 2.00 in the morning. We were to be picked up at 5.00 in the morning, so I hardly had a couple of hours to catch some sleep. I tried hard to sleep, and the harder I tried, the more difficult it became. Finally I gave up, and sat in the huge armchair, looking at the silhouetted of the beautiful woman on the bed. Tomorrow was the day, I thought. I had got everything planned to a ditto and was sure I could pull it off. I had waited for this day for too long, it was now or never. We were ready when the car came to pick us up at 5 am in the morning. After a short drive we arrived at our destination. We were ushered into a comfortable looking room and asked to be seated at a table laid for two. We were served breakfast, which we enjoyed quietly, none of us speaking but communicating silently with each other. "We are ready for takeoff sir!" said the man who came and stood respectfully by our table. Shall we go? Said I, as I gave her my hand and helped her out of the chair, not responding to the question in her eyes. "This way, sir!" the man lead us to the middle of a large field where a huge balloon stood. "Wow"! So this is the surprise? She blurted out, looking at me. I just smiled and nodded as we got into the basket of the Balloon. "Is it only the two of us?" she enquired incredulously. Yes, I said nonchalantly, as I thought, it has to be the two of us, after all I have paid 1500 Euros for this private Balloon tour. 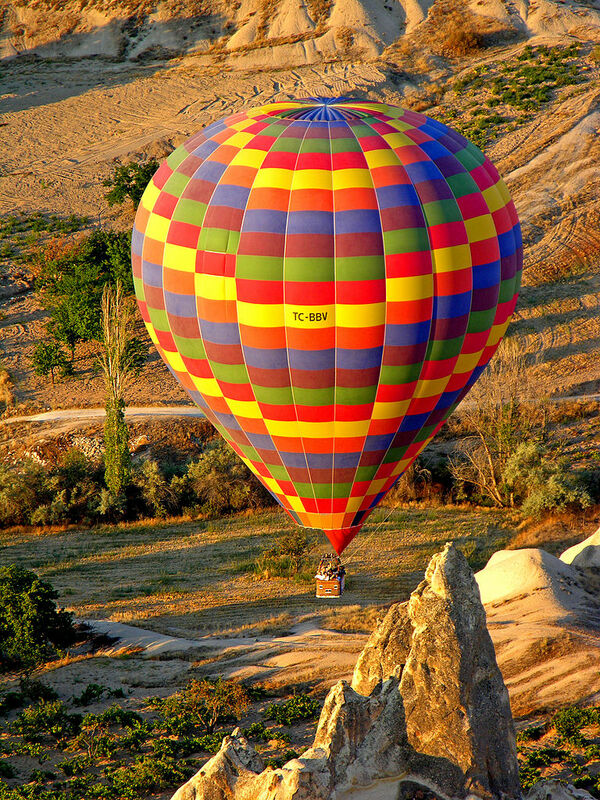 Soon we rose high up in the air, we rose to about 10,000 feet and we floated over the beautiful Cappadocia region. We could see the beautiful landscape of rocks stretching out below us, getting illuminated by the first rays of the sun. We turned eastwards and the sight that we beheld was breathtaking. The sun was peeping out from the horizon in all his flamboyant colours, his rays etched brilliant and colorful patterns in the sky and the rocky landscape beneath our feet was bathed in myriad colours. The whole setting seemed surreal and had a magic of its own. To add to the magic, the soothing notes of a violin emanated from a hidden speaker in the balloon. Now! I thought to myself. She was gazing at the rising sun, lost to the world, perhaps lost in her own memories. I gently took her hand in mine and huskily whispered, "I love you mom"! She hugged me to her bosom, a tear escaping from her eyes, but she immediately wiped it off. She turned to me and said sternly, "So this was the surprise that you planned", "you must have spent a fortune for this trip". I smiled at her and said, "No, not a fortune, what I spent was peanuts, I could spend a fortune just to see that twinkle in your eyes. I poured out the Champagne which came along with the Balloon tour and placed the glass in her delicate hands. My mom smiled at me, a smile that brought to prominence the dimples in her cheeks and transformed her into one of the most beautiful women I had ever seen. I felt a surge of happiness; I had never seen her smile like that after my father passed away 10 years ago. Happy Mother's Day to all the wonderful Moms in this World!